Today, instead of our usual stitch-in, we visited the Hooked Rug Museum in Hubbards, NS. There is an admission charge, but what is on display inside is truly inspiring. There are several rooms of hooked rugs and the variety of sizes and designs is astonishing. The history of the craft from the earliest settlers to modern interpretations is well represented. And the Noah’s Ark Exhibit is epic! Try and visit if you can; you won’t regret it! Marie-France has been enormously busy finishing these lovely embroideries. 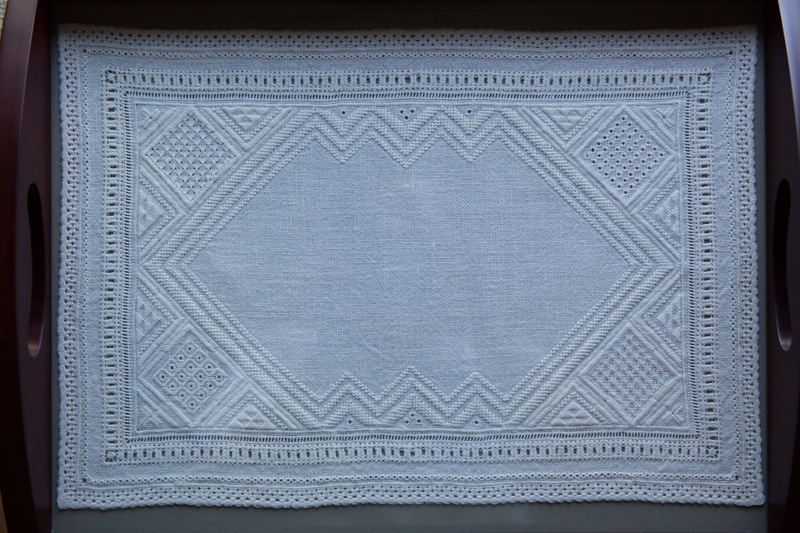 The Danish counted thread white work design is called Katie’s Hyggelig Tray Cloth. And here is a beautiful Heirloom Wedding Sampler which will surely be a treasured gift for the new bride and groom. Deanne completed the “One Long Panel” design by Laura J. Perin. Congratulations, it turned out beautifully. This joint project has been undertaken to mark the 150th anniversary of Confederation and consists of two large embroidered panels – East and West – which, when completed, will be on display in the Governor General’s residence in Ottawa. The East panel has made its way to our guild and many of us are eager to contribute some stitches. We are all looking forward to seeing the completed work.